My favorite color as a young child was purple. It didn’t require any deliberation for me to make that choice; purple was self-evidently the most attractive color in a box of crayons. Anyone could see that. In fact, I remember being perplexed at people whose favorite color was something other than purple, and downright shocked when someone claimed not to like purple at all. But the early days of childhood were ones in which we were too young to make serious value judgments. Everyone had a different favorite color, shape, animal, or song, and all choices were equally good. But by the time I was halfway through elementary school, I had begun to realize that not everyone adopted an attitude of tolerant acceptance when it came to one’s choice of favorite color. “Purple is for sissies,” my classmates insisted, and made fun of me for having such an unhip favorite color. (Had I been more confident and quicker on my feet, I might have countered, “Oh yeah, then why do kings always wear purple?” I probably would have regretted saying that, though, as soon as someone produced a picture of a king wearing tights. Children can be cruel.) As a measure of self-preservation, I decided the only safe course was to change my favorite color. I was at a loss to know what a reasonable second choice would be. I asked my mother what her favorite color was, and she said, “Blue.” I thought about that. I figured blue was a pretty OK color too, and it was definitely a safe and culturally acceptable favorite color. So right then and there, I decided to convert. For the next 10 years or so, I proudly and persuasively claimed that my favorite color was blue. When I got to college, however, I began to learn how to think for myself. My cousin Jeff, who was a senior at the same college when I was a freshman, was my inspiration. He always—always—wrote in purple ink. And yet he was popular and well-respected. I briefly considered that he got away with this only because he was imposingly tall, but I eventually realized that he had simply never accepted the unwarranted criticism of his color choices and had made a habit of standing up for his beliefs. Emboldened, I recanted my errant allegiance to blue and restored purple to its rightful place as my favorite color. There was just one problem: in those days, purple pens were not easy to locate. I asked Jeff discreetly about his supplier, and he said that his mom kept him in stock. About a week later, a care package arrived from Aunt Janice: a year’s supply of purple pens. You may be wondering what, other than this endearing autobiographical story, is actually interesting about purple. I’m glad you asked. But what about violet? Violet has its own band on the spectrum, on the other side of blue—and isn’t violet just another name for purple? Well…yes and no. Technically, the poem is correct: “Violets are blue.” Violet is really nothing more than a very dark shade of blue, just as indigo is a light shade. By definition, violet can’t have any red in it, even though we commonly talk as though it does. Frustratingly, dictionaries are misleading on this subject. In Webster’s Revised Unabridged Dictionary, one of the definitions of violet is “a color produced by a combination of red and blue in equal proportions; a bluish purple color,” while in the same dictionary purple is defined similarly as “[a] red and blue color.” True enough, you can mix red and blue paint or pigment and see purple, but if you’re going to be nitpickingly accurate, you can’t call any mixture of red and blue “violet,” and you must be willing to accept that what you see as “purple” is really an illusion created in your brain. That’s not to say that purple (illusory though it may be) doesn’t appear in nature. According to an ancient Roman legend, in about 1500 BCE, Hercules was walking his sheepdog on the beach one day. After the dog bit into a mollusk, its mouth turned an unusual color. 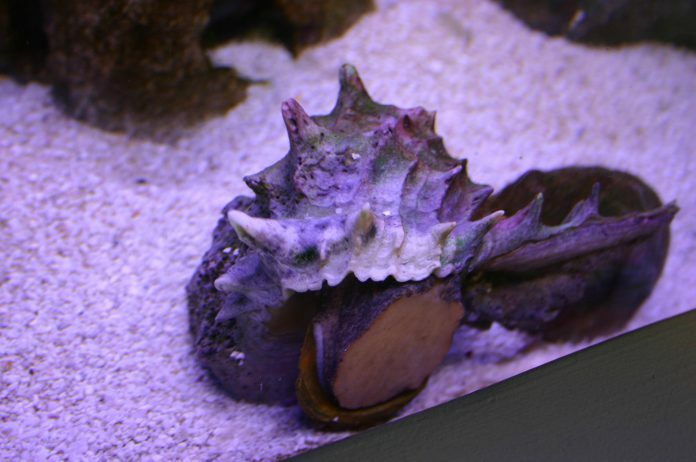 The mollusk, known as murex, was the first source of purple dye for fabrics—a pigment called Tyrian purple. The process by which the coloring agent was extracted, which required salt, heat, and water, was difficult and labor-intensive. In addition, each mollusk produced such a small quantity of dye that thousands were needed for a single garment. This is why purple was so expensive and came to be associated with royalty—generally the only people who could afford such extravagance. As recently as the mid-1800s, purple dye was still very hard to come by. Fabric dyes, based as they were on plant and animal products, for the most part produced colors that were bland and subject to fading. Synthetic dyes were invented by a happy accident. In 1856, an 18-year-old chemistry student named William Perkin, working in his home lab, was trying to synthesize quinine, an antimalarial agent. One of his experiments failed, but produced a beautiful powdery residue, which when dissolved served as a brilliant and colorfast purple dye. Perkin’s dye came to be called “mauve,” and in almost no time it was extraordinarily popular. Other synthetic dyes soon followed, and now form the basis of almost all fabric coloring. Note: This is an updated version of an article that originally appeared on Interesting Thing of the Day on August 25, 2003, and again in a slightly revised form on November 29, 2004.